Jackson Frames offers a solution for all kinds of photos, including professional or graduation shots, as well as your favourite family snaps. We can match your degree frame your graduation photo frame or you can pick an entirely different style. 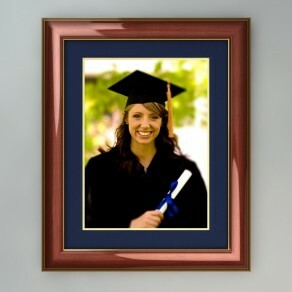 Graduation frames come with your university emblem embedded in the mat board at the bottom. 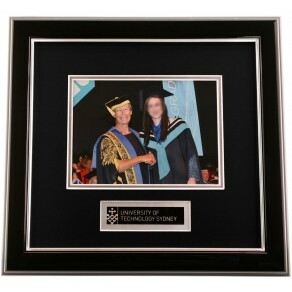 You might also wish to combine your photo with your degree, check out our range of double frames for inspiration. Upload your photo and we’ll frame it and send it back to you ready to hang on the wall. We’ll even print your photo free of charge. Order online and we’ll mail your chosen frame, along with comprehensive instructions, right to your local post office. You can also order a frame from our booth at your graduation and take it home the same day. Highly polished black piano finish with two silver trim lines on the outer edge and one on the insid..